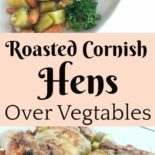 Roasted Cornish Hens Over a Bed of Flavorful Vegetables! 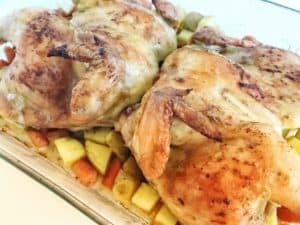 If you are looking for an easy Cornish hen recipe that gives you an entire meal in one pan, you have found the right place! 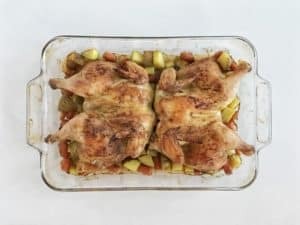 These roasted Cornish hens are covered in savory seasonings and served on top of a bed of vegetables. You don’t have to be a millionaire to feel like you are eating like one! I have to admit, I never thought I would be able to cook a Cornish hen! 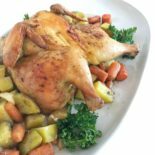 In my mind, Cornish hens were something that “fancy” people ate at their homes, sitting at a long banquet table, with dainty napkins tucked under their chins and silverware clinking in the background, lit by candles. In actuality, these little babies couldn’t be easier to make! I promise that this recipe is so simple and so tasty, you will have trouble keeping your families hands off of it! We make two hens at a time, and this amount can feed our family of four twice. You can also serve with rice if you want a little added volume. Take defrosted Cornish hens and remove the bag of innards. Discard the bag and rinse the hens both with cool water and pat dry. 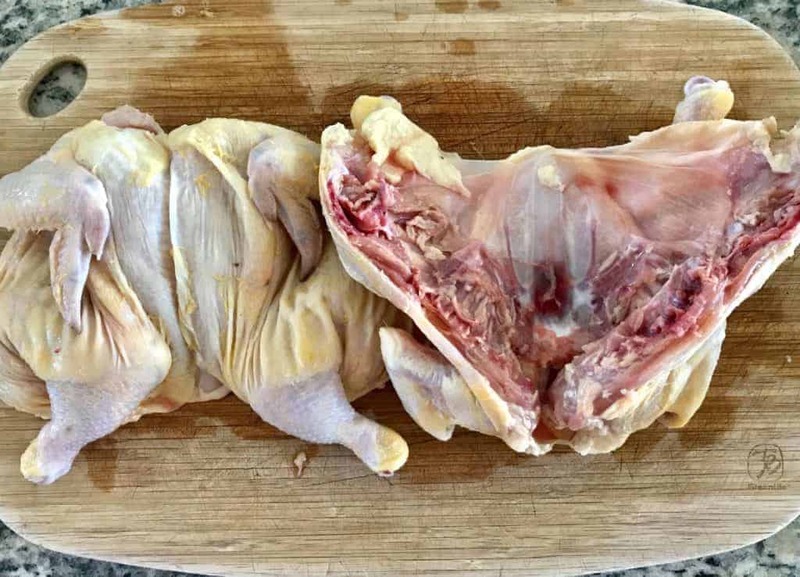 Lay both hens on the cutting board and butterfly open down the backbone. I prefer to butterfly the Cornish hens on the backbone side because the breastbone is really hard to get through. You can either use a sturdy knife to butterfly the hens open or kitchen shears to cut along the backbone. Once your hens are nice and dry, mix the soy sauce and the butter together. 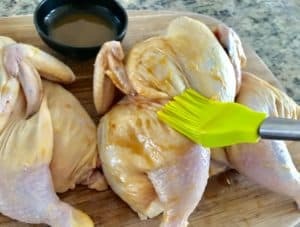 Using a basting tool or your hands, rub the mixture on both hens, inside and out. Taking one of the dry rub bowls, sprinkle the spice rub evenly over the Cornish hens, inside and out. Rub into the skin and meat with your hands. You can reserve any spice rub left over for the vegetables. Set the hens aside and prepare the veggies by cutting them all into 1-inch or so chunks, covering with oil, and sprinkling with spices. 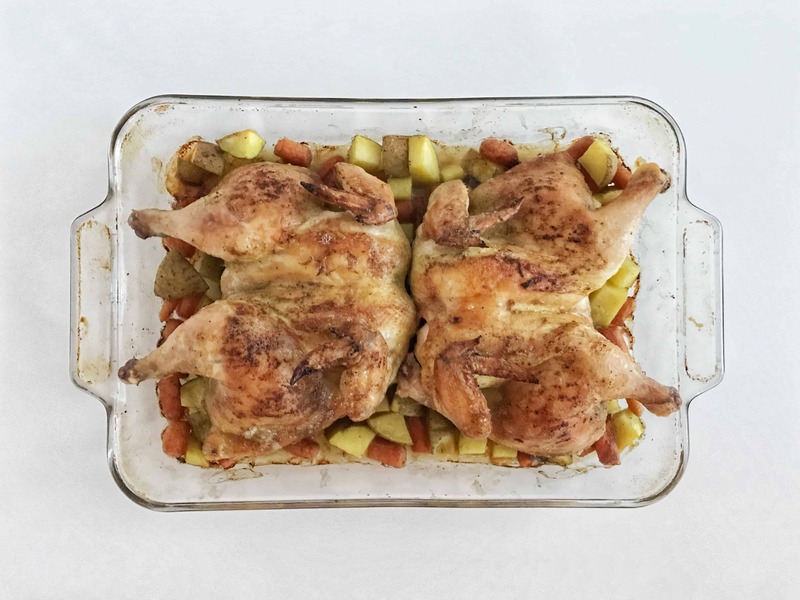 Put your veggies in the bottom of your pan (we use a glass Pyrex pan) and then cover with the Cornish hens, legs facing the ends of the pans. Now you can place in your pre-heated oven and roast according to the instructions below. Even veggie hating children love these roasted veggies! My son didn’t want to eat the potatoes, but I made him try one. He walked away from the table chewing…then circled back to eat every bite off of his plate! Combine all 5 ingredients for the dry rub (salt through pepper). Divide by half, place in two separate bowls. Set aside. 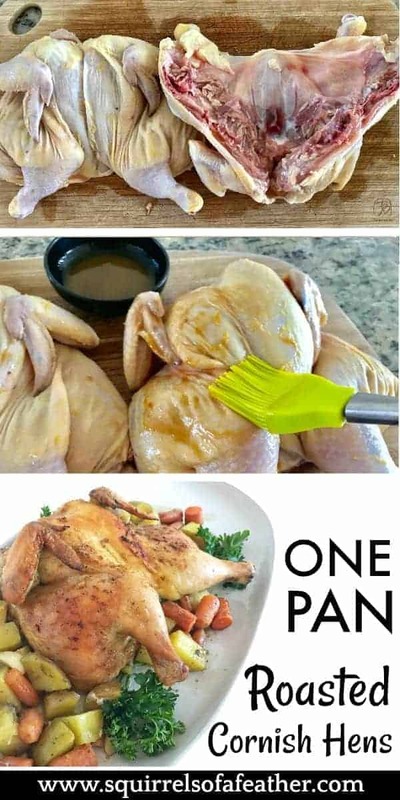 Take defrosted Cornish hens and remove the bag of innards. Discard the bag. Rinse both with cool water and pat dry. Mix the soy sauce and the butter together. Using a basting tool or your hands, rub the mixture on both hens, inside and out. Set hens aside in oven safe roasting pan. Cube potatoes into 1 inch by 1 inch chunks. Cut the baby carrots in half. Place carrots, potatoes, garlic cloves in a mixing bowl and drizzle with oil. Mix to cover all with oil. After vegetables are covered with oil, sprinkle with the remaining spices, mixing as you add. Ensure that all vegetables are evenly covered with the spice mix. Remove hens from the roasting pan and put the vegetables into the bottom. Place hens on top of the vegetables, with the breast to the interior and legs facing outwards. Bake at 425° for around 40-50 minutes, or until chicken is cooked through and no pink remains. I cooked a total of 50, started checking at 40 minutes. Remove, allow to rest until able to hands. Serve. « Decluttr Review: Is the Decluttr App Really Worth Your Time?